sauerkraut and homemade sauce on the side. Crispy Pata is definitely one of our well-loved Pinoy favorites. But just imagine if this deep-fried treat levels up, becomes healthier and served with sauerkraut? Wait no more. This is actually being served at Brotzeit. 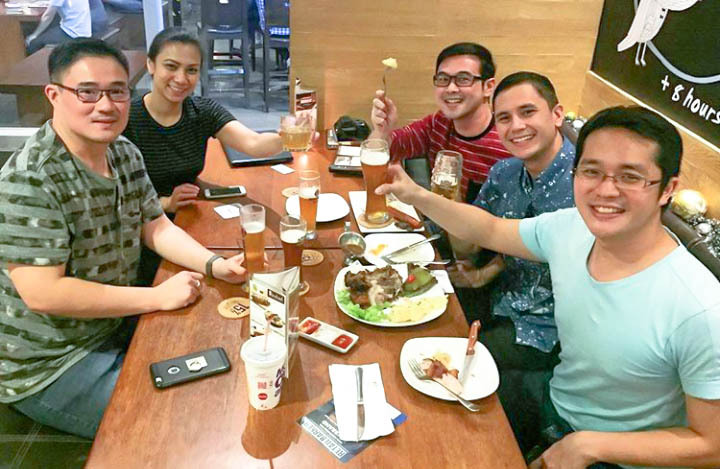 This German restaurant brought to Manila what Germans love and they prepare this so well that it’s something you can order again and again and again with friends and family. You see, their crispy pork knuckles are oven-roasted, it means less oil right? A lot of the fats are no longer there, and yet the skin remains crunchy and the meat is so tender and flavorful. I just had to jump to the main course. 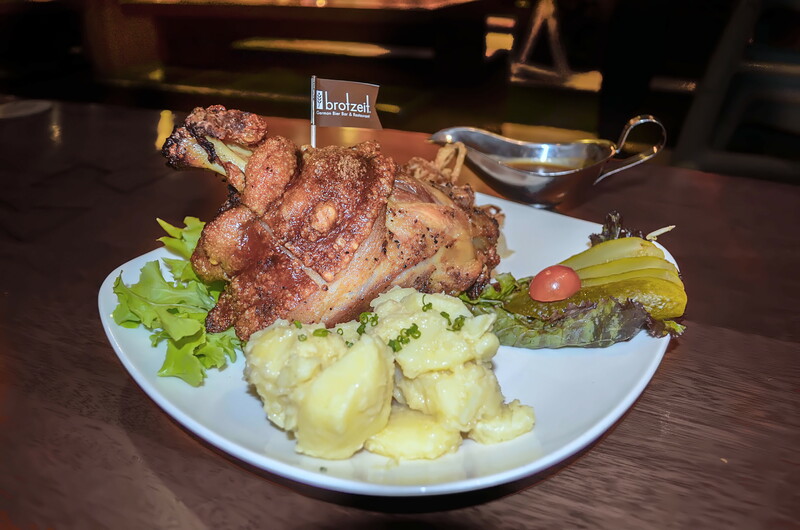 So, let’s go back a bit and do the soup and appetizers served at Brotzeit to make you experience a complete German gastronomic adventure. 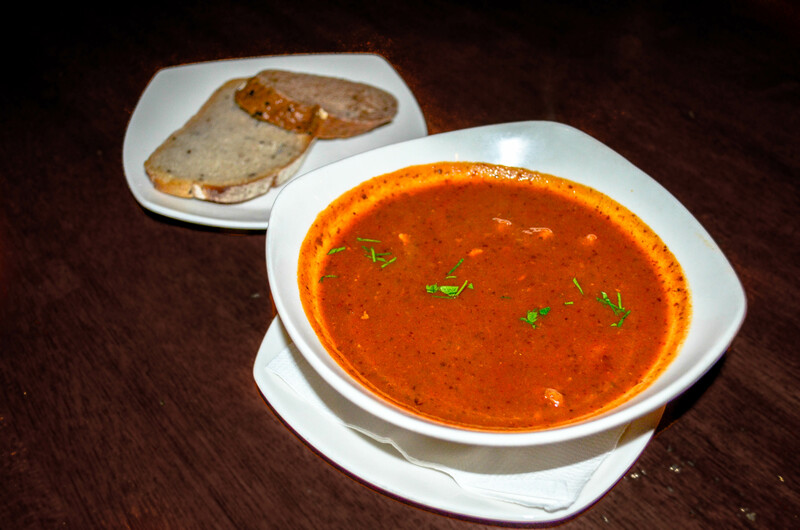 Germans love the goulash soup, so you might as well try it yourself and feel like a German. Well actually, goulash soup was made by Hungarians but loved by Germans too. It is traditionally a soup or stew with meat, mostly beef, heavy on paprika. Other ingredients like onions, vegetables, herbs, spices and seasoning are added. 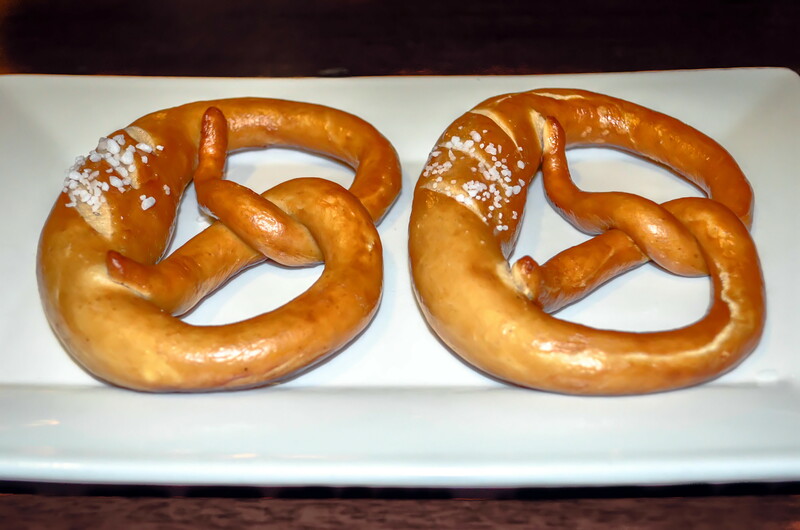 You can also try the Bavarian pretzel. It’s good for sharing. It’s not the kind of pretzels I grew up with, that are sweet, small and crunchy. This pretzel is baked, big and soft. In sports bars, caramel is served for dipping, but here, why not try their mustard as the dip!? And here are more items to order for the main course. Salivate with steak! The grilled flank steak is so tender and tasty. 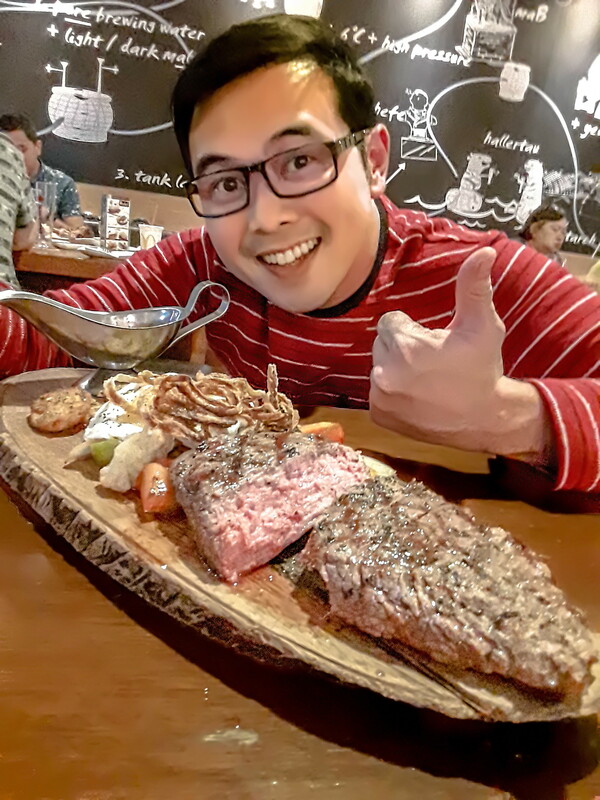 They don’t mask the steak, it’s just salt and pepper to let you fully enjoy the mouth-watering taste of the beef. Grilled rosemary marinated flank steak with roasted potatoes and vegetables garnished with fried onions and peppered egg. 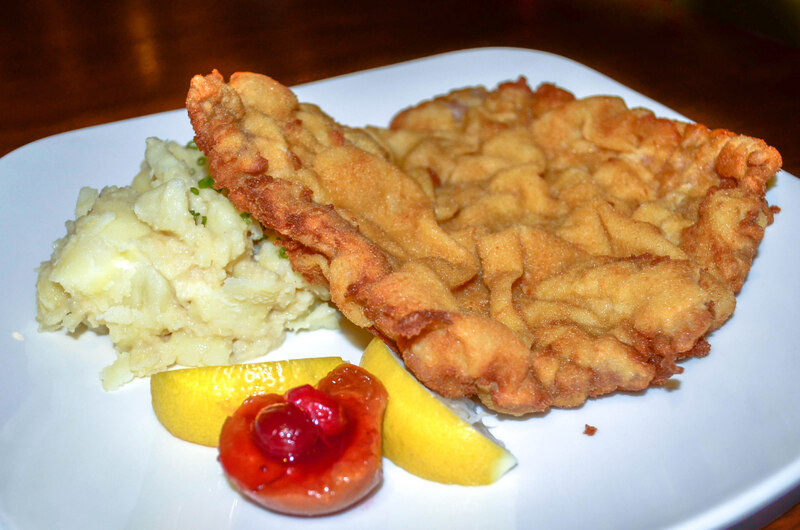 Another German favorite is the schnitzel. I recommend you order the veal schnitzel. Veal is meat from young cows. Compared to pork or chicken schnitzels, for me, the veal schnitzel is better. Mas malinamnam. Served with potato salad, apricot and cranberry sauce. For dessert, order their warm chocolate cake or apple strudel. Both are served with ice cream. Of course, it’s a must that you devour their best-tasting German sausages. In fact I wrote a separate article just for the sausages. Read it by clicking here. And what’s a German experience without experiencing their world famous beers? Paulaner, the No. 1 Weissbier in Germany. The typical beer from Munich: top fermented, unfltered, made with roasted wheat malt. Paulaner, a full-bodied beer from Munich. Chestnut brown, naturally cloudy, top fermented and unfiltered, made with roasted wheat malt. Paulaner, a dark lager beer from Munich. Characteristic ruby brown hue comes from caramel malts and is filled with a rich malt sweetness.